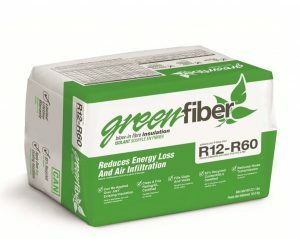 What is R-Value and how does it help in Insulation? It’s essential that insulation in your attic is installed with the right R-Value. Insulation in your attic helps provide resistance to heat/cold flow reducing your cooling and heating costs. Your insulation’s ability to resist the transfer of heat/cold is measured by R-Value. Meaning, the higher an insulation’s R-value, the better the ability to withstand the flow of heat or cold. It is important to note that the R-Values are not directly related to the thickness of the insulation, but it is however compared to the number of fibres per square inch or the density of insulation. Ontario Building Code continuously increases requirements of R-Value for attic insulation, in 1992 the minimal value was around R-32, and in 2018 it is recommended to be between R-50/60. 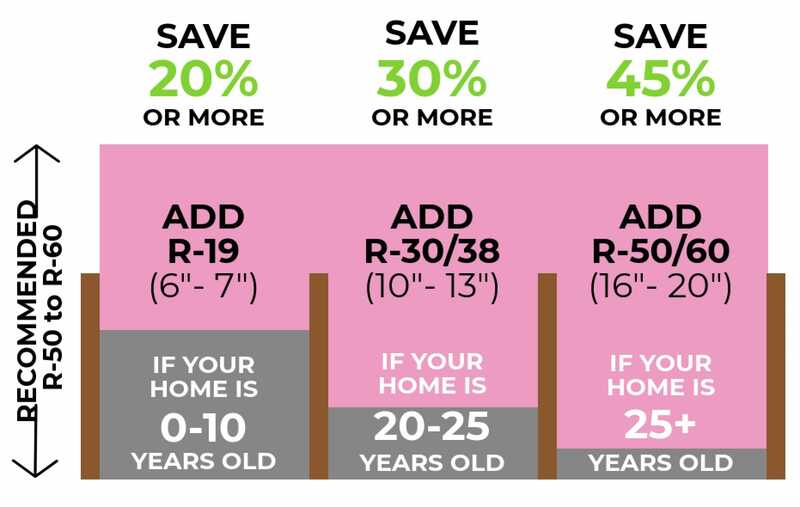 So if your home is over 25 years old and insulation in your attic has never been updated the likelihood that your R-Value between 15 – 30 is very high since insulation materials settle over time. 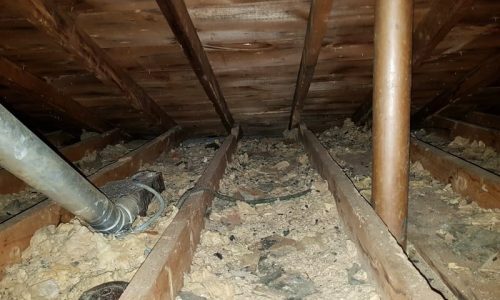 Moreover, if your house built in the early ’70s, it might have a little bit of insulation in the attic or even empty cavities between the joists. Therefore you would need to bring it to today’s’ standards by adding the top-up layer of blown in insulation. Our technicians are continually trained in the industry’s best practices and are equipped with the best technology to remove old insulation without creating a mess and installing new insulation quickly, efficiently and effectively. Hire our experts to remove your old insulation. 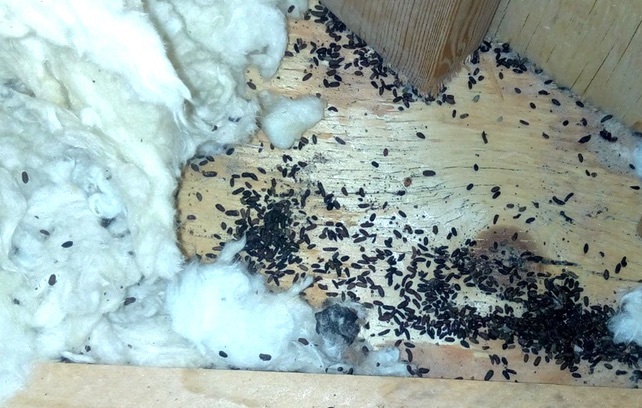 The material might be toxic especially if you’ve had wildlife or pests living in your attic. Animal feces contain many disease-causing pathogens that soak into the insulation and make it dangerous to inhale or handle. Mold and mildew are also toxic and shouldn’t be handled without proper gear including gloves and respirator or face mask. 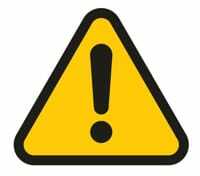 It is also dangerous working in an attic that is not properly ventilated, working in tight spaces and with unstable attic floors. Our professionals are used to working in all kinds of spaces and environments and will do a better job removing the old insulation. They also remove toxic material without contaminating the rest of the house and know how to dispose it safely and responsibly. Proper insulation is vital when it comes to having a healthy comfortable home. Apart from keeping your energy bills low, they prevent mould growth and also keep out unwanted noise. We recommend R-Values of 60 in the attic for maximum savings and comfort. Proper insulation in attics helps prevent warm air from escaping through celling and forming moisture. When warm air hits a cold surface in your attic, condensation occurs causing frost or water damage, that results in the growth of mould and mildew, which is a health hazard and damages your attic. Well-insulated attics help keep the indoor temperature in balance and prevent moisture buildup, better sound-proofing and better air quality inside your home. 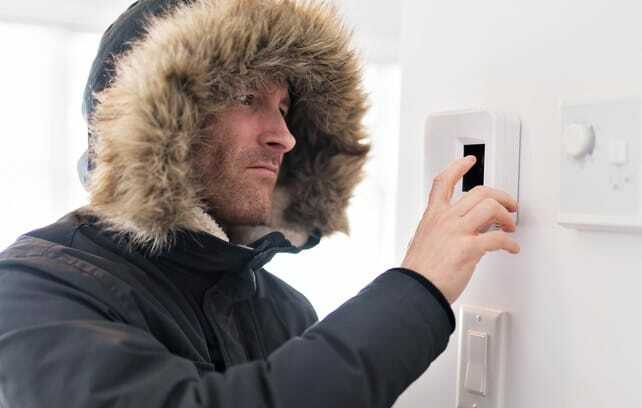 According to statistics, the adequately insulated home can reduce heating and cooling costs between 20% – 50%. Proper insulation will also help extend the life of your furnaces and air conditioners. Since your home’s heating and cooling is reduced by appropriate attic insulation, your HVAC will run fewer hours to maintain comfortable temperatures, incurring less wear and tear. If snow on your roof is forming ice dams even during freezing winter months, then it can indicate that there is a problem with insulation in your roof space. Ice dams are icicles that are normally formed when the snow melts and runs down your roof, freezing close to the edge. 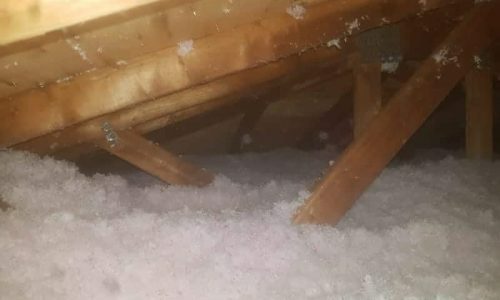 This happens when the hot air escapes into your attic and warms your roof above 0 degrees causing the snow to melt, however, the edge of the roof remains below the freezing mark. Adding more insulation to your attic floor (R-60) will help keep the temperature and air flow even and preventing the formation of ice dams. What Happens to The Old Insulation? 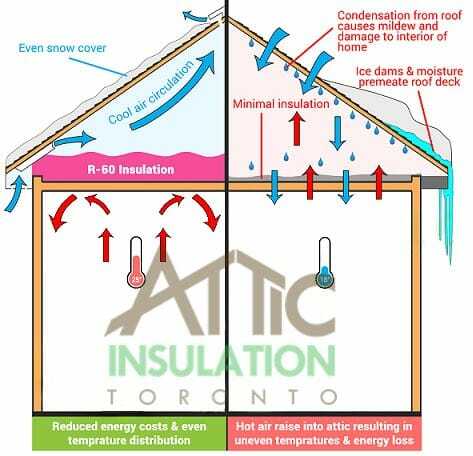 Attic Insulation Toronto specializes in removing old insulation and installing new blown in cellulose insulation. Our technicians are equipped with proper safety gear to handle toxic or dangerous material. We also transport and dispose of toxic materials safely and responsibly. Our team uses high-tech equipment to remove the old insulation without contaminating the rest of the home with dust, debris or other allergens. This is critical in cases where there are suspected toxins or contaminants in the old insulation. Hire us to inspect existing insulation, remove old insulation and/or install new insulation. Common signs of damaged or contaminated insulation include thermostat issues, ice buildup on the roof and mould outbreak in the house. Remove old insulation and air-seal the attic before installing new insulation to get the best possible performance and return on investment. 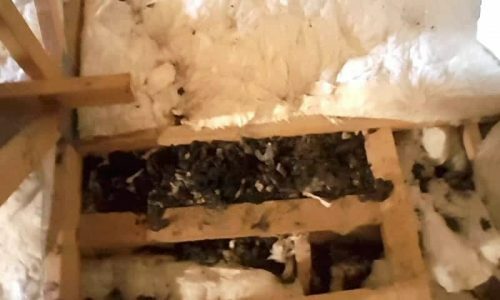 Contaminated, old, moisture-damaged and decaying insulation is dangerous and poses serious health risks including allergies and respiratory infections. Common causes for damaged insulation include excess moisture in the attic, smoke damage, contamination by wildlife and pests, age and a leaking roof. 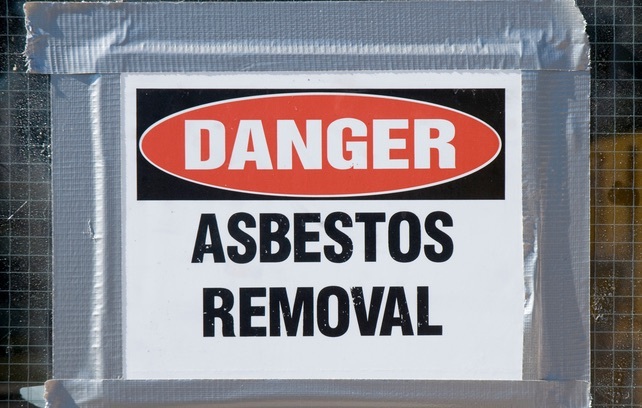 Many homes built before 1975 have asbestos insulation which is not only illegal for insulating and fireproofing but also considered a toxic and hazardous material. An un-insulated home can lose up to 60% of the energy produced indoors, primarily through the attic and walls. There are up to 10 different options for insulation on the market today. 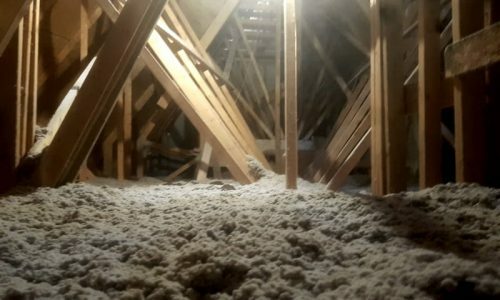 Lacking a protective layer of insulation in your attic will lead to losing money, comfort, and the increase of carbon footprint. That is where Attic Insulation Toronto comes in. We are confident that we have the right personnel and products for your attic. Your home’s cooling and heating costs account for up to 60% of your home’s energy expenses. With our professional input and assistance, insulating your attic is the most cost-effective and rational means to cut on your monthly energy consumption. We specialize in improving insulation in attics and remediation services. We offer professional service delivery and outstanding customer service. Just like your home, your commercial building’s attic requires proper insulation. Without proper insulation, your building is prone to damage and energy loss which will result in high energy costs. We offer a wide variety of insulation services to fit your commercial needs. We have experience installing insulation on some of the most high-profile buildings in Toronto. Our insulation professionals are well experienced to effectively recommend the best commercial insulation services for your new commercial project and to spot any deficiencies in your current insulation application. As experts in commercial insulation, we know there is no better choice than our team. There are two main types of insulation blown-in insulation and batt insulation. Each has its own unique advantages and applications so speak to our experts for recommendations on the best option. Since the insulation is loose fill, it fits in gaps and cracks without leaving any weak spots. It is also great for insulating around odd-shaped structures and fittings. The tight and compact seal makes this option very energy efficient; up to 22% more than ordinary batting solutions according to some experts. A typical blow-in installation is a two-man job. One feeds the machine while the other handles and directs the hose. The job can be completed quickly if performed by our experts. We use only the best equipment and high quiality materials. The tight and compact place fit means that the insulation makes a great sound barrier if you are looking for soundproofing qualities along with energy efficiency. Blown-in attic insulation offers a great return on investment. Most homeowners recover the installation cost in the first 2 – 4 years. Get our experts to inspect your attic and recommend the best material for your blow in insulation in Toronto. Hire our experts. 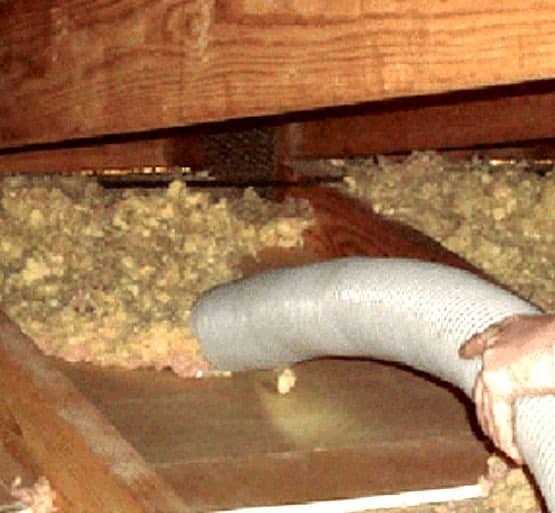 We can remove the old insulation especially if your attic has moisture problems, pest and wildlife infestation (rats, mice, squirrels, raccoons, etc. ), insulation installed before 1975 (it might be toxic and contain asbestos). Only professional installers can guarantee that you get all mentioned benefits and more from your new attic insulation. 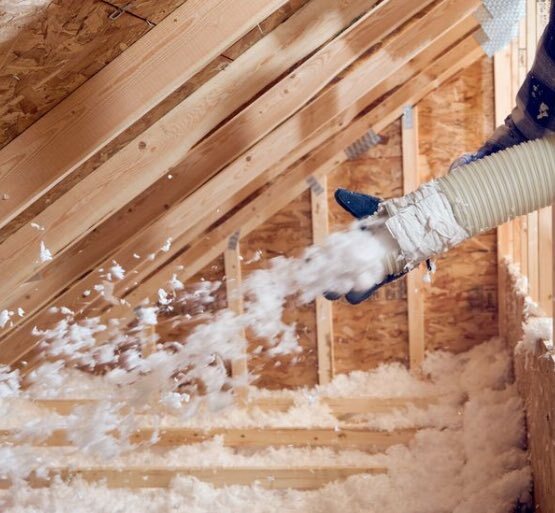 Blow-in insulation is installed by literally blowing loose-fill material into place. Cellulose is a good option for loose-fill insulation. Other types include fibreglass and mineral wood. Our technicians have combined decades of experience installing blown in cellulose insulation. Installing blown in insulation can be a messy job but our experts leave the work site as clean as they found it. 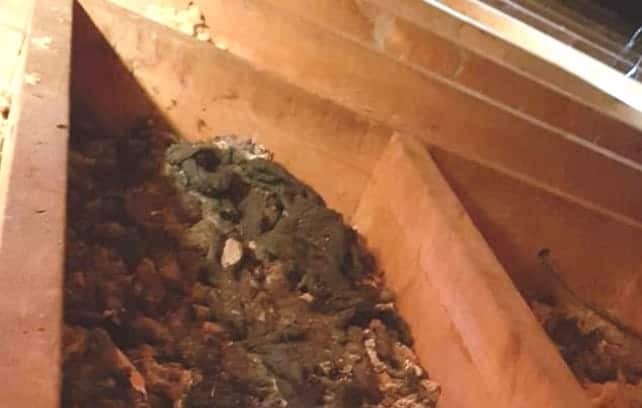 The material is fed from outside the house and the hose secured in the attic to ensure that dust, debris and allergens don’t find their way into the main house. Another concern when installing blow-in insulation is settling which reduces the insulation’s effectiveness over time. Our experts are able to work around this issue whether that means using the additional material or other solution. Our procedures are non-invasive and rarely involve tearing up drywall or other such extreme measures. For decades we has been the installer of batt insulation in Toronto. 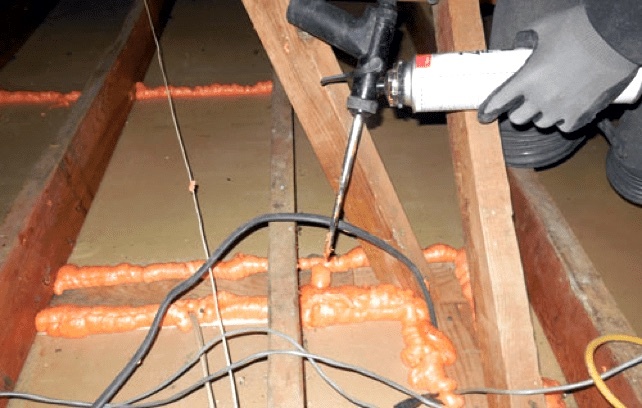 Batt insulation is an excellent option for insulating ceilings, walls, floors and attics especially in unfinished spaces where the batts are installed between studs, joists and beams. Our professional technicians do a pre-installation inspection to determine whether batting is the best option. Our contractors also advice on the best material for your application. Aside from these benefits and more, many of our customers recoup their initial investment in as little as 3-4 years. 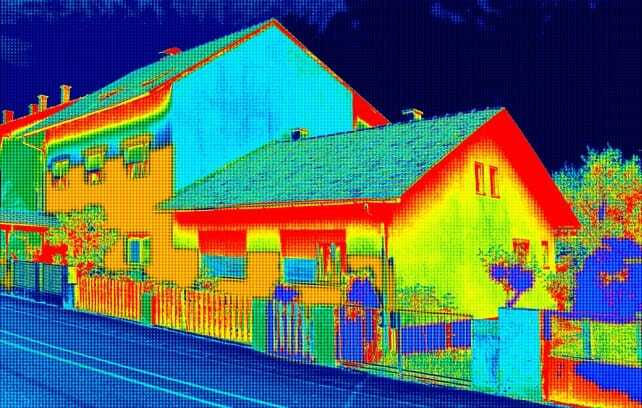 Insulation can slash your energy costs by up to 80-percent. The first step is the pre-insulation walkthrough. This allows the Attic Insulation Toronto technician to get a sense of what is required in terms of batting material and other information he needs to formulate the way forward. Next is the preparation which includes cleaning and air-sealing the attic or space to be insulated. The procedure here depends on the space and sealing requirements and may include sprayed on sealing, caulking, taping or a combination of these. Finally, the technicians install the batt insulation using the industry’s best practices, specialty equipment and hardware. All our insulation materials meet all local and national government guidelines and sustainability requirements. Our expert’s advice that you should have your attic insulation inspected at least once a year or so. Although insulation can last 80 or even 100 years, there are many causes that can compromise the insulation’s life. Hire our technicians for a thorough inspection and subsequent recommendations for your attic insulation project. Upgrading your insulation can improve your home’s energy efficiency drastically and slash monthly bills by up to 80%. You can recoup your investment in as little as three years if you get the job done by an expert. Installing new insulation is a positive step in many instances, however, there is such a thing as over insulation. Installing too much insulation compromises your home’s ventilation and may cause moisture to get trapped inside the house especially in the attic. A far more common downside of installing new insulation yourself is under-insulation. 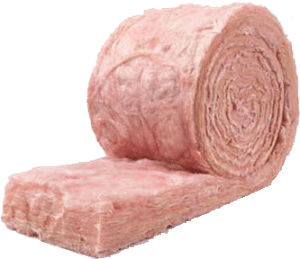 Signs that your new insulation is deficient includes uneven temperatures and drafts in various rooms, higher utility bills without having increased your energy usage and the second floor is unusually warm or cold during summers or winters. 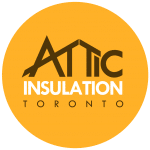 Our Attic Insulation Toronto experts can guarantee your attic is properly insulated and with the proper material for your situation. Again, there are pre-installation procedures that ultimately affect the performance of your new insulation. There is also the question of whether it is necessary to remove the existing insulation. You may not even need new insulation if your energy efficiency issues are due to a faulty HVAC system. Our experts take all these factors into consideration before coming up with the best course of action. Attic cleaning is an integral part of the pre-installation procedure and is best left to a professional. Once the insulation removal process is complete and if required we provide attic cleaning services. Our technicians are experienced in working in tight spaces and have the equipment and tools required for proper cleaning and sanitizing attic spaces. Dust and dirt are an obvious problem since the attic generally sits undisturbed for long periods of time. This dust is easily transferred to the rest of your home via the HVAC system and compromise the indoor air quality. This is can be an especially serious issue for households with small children, the elderly and people with respirator problems. 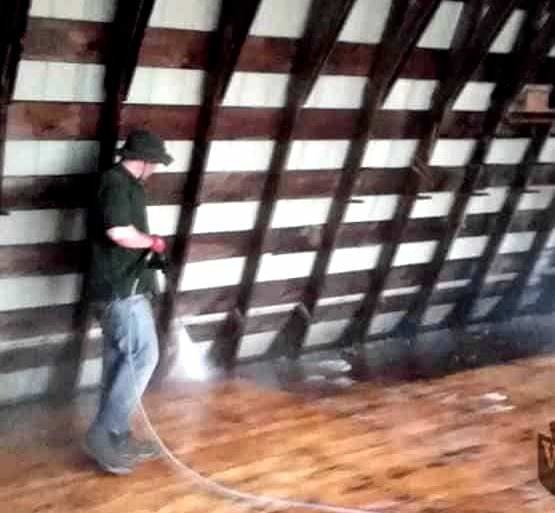 Attic cleaning and sanitizing is a must after a rodent or wildlife infestation. Handling rodent feces and urine yourself is not a good idea because of the airborne pathogens contained therein. Our expert cleaners not only remove feces, urine and debris left behind by rodents and wildlife but also sanitize the area to kill disease causing organisms and deter other animals from breaking into the attic. Pheromones found in animal urine and feces can attract other pests for up to a kilometer if not cleaned properly. Our strong cleaning agents eliminate these concerns and more. You also definitely need proper attic leaning after removing old insulation. This process helps to identify areas that require air-sealing and ensures you don’t install new insulation over animal urine and feces, mold and mildew, dust and other contaminants. There are laws protecting wildlife in Canada so make sure that you are well versed before attempting to capture or remove wildlife on your own. It is illegal to kill or harm protected wildlife or transport protected wildlife for more than a kilometer without a permit. Traps aren’t nearly as humane as most people think especially if you don’t have the expertise to use them. Many wildlife die from exhaustion, dehydration, starvation or by getting mauled by prey or pets because they were left in the trap for too long. You are liable to be charged with animal cruelty in such a scenario. 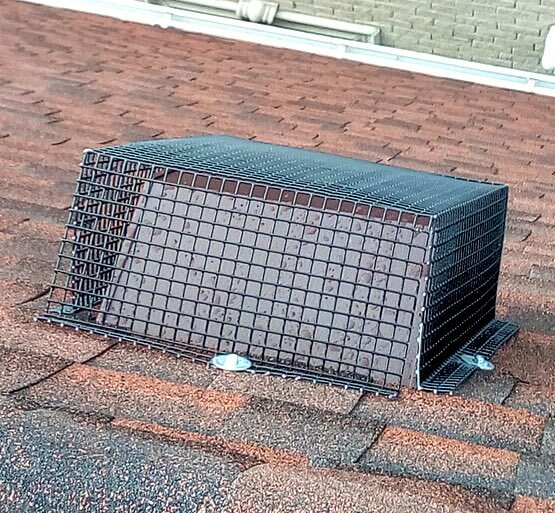 At Attic Insulation Toronto we have wildlife removal experts that have extensive knowledge of wildlife behavior which allows them to come up with the most efficient and safest removal techniques. We prefer exclusion or eviction because it is the most humane way to handle wildlife in residential buildings. There are occasions where tapping may be the only solution but this is done with care and expertise to guarantee the safety of the animal, residents and pets. 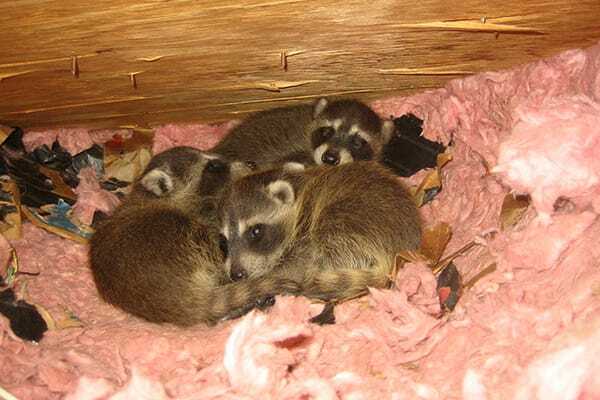 We remove all kinds of wildlife including squirrels, raccoons, bats, skunks and much more whether they are nesting in the attic, in the garage or under the deck. Our services also include thorough cleaning and sanitation after evicting the animals and finally, attic restoration if necessary. Our technicians wild-life proof the home with galvanized steel mesh or metal flashing to guarantee that the animals don’t come back.